Published on December 29, 2013 in General T&T, ILP, People's Partnership, PNM, Politics and UNC. 1 Comment Tags: Crime in T&T, Jack Warner, Kamla Persad-Bissessar, Politics, Raffique Shah. Politically, 2013 will be remembered as the year of unprecedented multiple elections. It was the year that marked the beginning of the demise of the People’s Partnership; the year in which Jack Warner’s meteor burned brightly before it died an unnatural death; and the year that saw the People’s National Movement (PNM), for yet another time, rise, Phoenix-like, from the ashes of defeat, to position itself for a return to power. Published on December 22, 2013 in Caribbean, Entertainment, General T&T, Jamaica, Music and USA. 3 Comments Tags: Bunji Garlin, Raffique Shah, Tessanne Chin. Just when it seemed that we would end 2013 with only memories of macabre murders, of innocent children being battered and slaughtered by barbaric adults, two Caribbean singers rescue us with their vocal and musical prowess, with the food of love that transcends the pettiness of insularity, lifts our spirits and maybe even our souls. 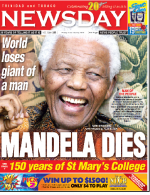 Published on December 22, 2013 in Africa, Culture, General T&T, International and Religion. 7 Comments Tags: Africa, African, Christmas, Kwame Nantambu. As Trinbagonians gear up to celebrate the Christian religious event of Christmas, it is apropos to disseminate the historical, Afri-centric , real truth about the birth of Jesus.